Just trying this again because what else is there to talk about? I check this site regularly - hoping to see these interviews. JLU and Super Powers are the only collection I have ... and it would be awesome to see what these interviews would have told us. Any chance soon - or an explanation why not? I keep hoping to read that the next three pack will be Mister Miracle, Virmin Vunderbarr and Granny Goodness. Hey - you can dream. 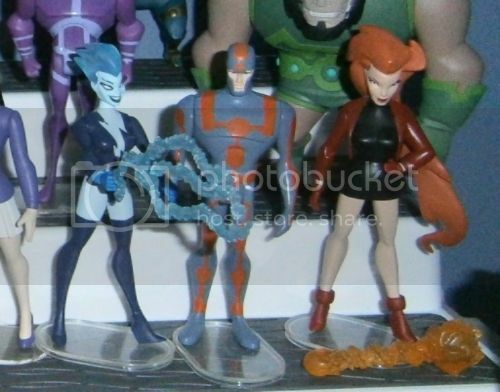 Batman Beyond 3 pack with Batman Beyond and Dee Dee X 2 !!! One of my most beloved lines. On the Batman Beyond front a set to finish the future league would have been cool. With Big Barda and Kairo plus Zeta from Zeta project. A six pack with Granny the remaining 3 furies and Steppenwolf and Desaad. heck I am still very upset no LUMINUS ! ! ! Man what a easy figure to make and he appeared on one of hte best STAS episodes and JL ! Wow, it's been over 3 years since the final JLU product and 3-pack came out on Marty Collector. Christmas time 2012. And I still haven't opened that final JLU product yet! Still in denial it's the last one I'm going to open I suppose haha. Just make your own, or have someone make it for you then. So I just read through all 9 pages on here after seeing that there might possibly be JLU interviews at some point and....NOTHING. Patience has to run out at some point with JLU fans, right?